Featured Product — A unique music store in Brown County, Indiana! What's not to love about Mainland Ukuleles, our pals just down the road here in Brown County, Indiana! This home grown family business is dedicated to providing quality performance ukuleles at a great price. And, this weekend you can save even more with 10% off your total price of any Mainland Ukulele plus Hardcase! Check out the incredible sound of this Mainland Mango Concert Ukulele! 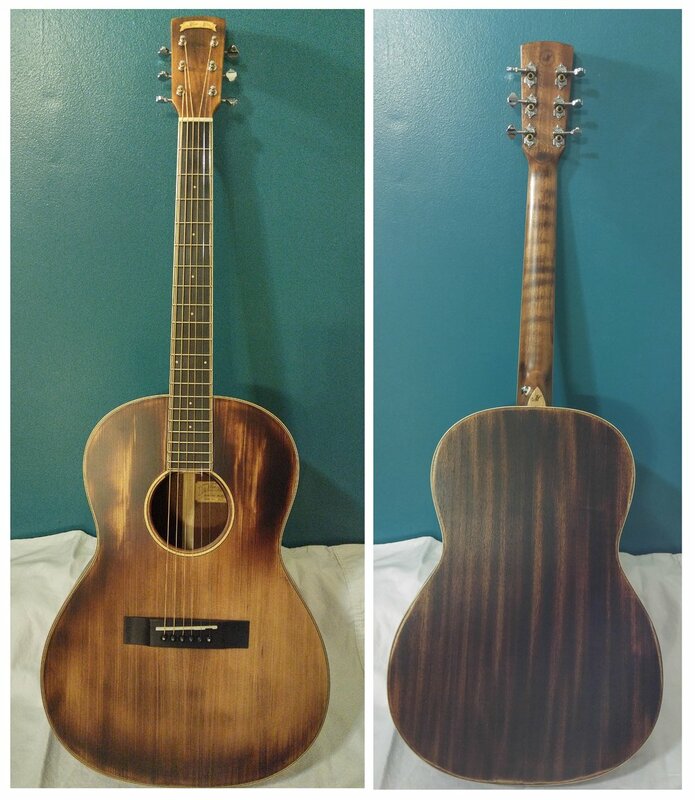 The Mango tonewood gives this uke a unique look and sound. Deep and resonant like mahogany, it also offers sweet, crystalline highs like koa, but with mid-range strength and clarity reminiscent of Sitka spruce. This beautiful Lady Annabella Celtic Folk Harp was built locally by Dan Speer of Argent Fox Music (Solsberry, IN). This diatonic, smaller sized Sassafras Harp features 24 nylon strings in the key of C. For over 30 years, Argent Fox Music has been known for providing incredible Celtic and Renaissance style harps with quality and durability in mind at affordable prices! And this weekend only, you can save even more money with an additional 10% off of The Lady Annabella Harp! The Celtic Harp has had a long history, with similar Irish Harps first appearing in Medieval Western Europe in the 8th to 10th centuries AD. Diatonic Harps, or Renaissance Harps, have been popular since around 1800 AD and played a very important role in Gaelic culture, legend, and folklore. Today, the Irish Folk harp remains popular and is an important part of Irish and world culture. These harps are typically priced at $750, but this weekend only, as part of our Friday Feature Special, we will be offering a discount of 10% off of these regular prices! Available this weekend for only $675!!!! Descending from the greatest jazz guitars of the 20th century, the Gretsch G6122-1962 Country Classic Electric Guitar combines stellar tone from Filter'Tron adjustable pickups and a laminated maple body with astounding visuals provided by 24k gold hardware, ebony fretboard, offset markers, multiple body binding, plus a bound fretboard and headpiece. With 2-1/4" body depth, solid brass gold-plated knobs, deluxe high-ratio tuners, and a gold-plated Bigsby, the Country Classic is definitely the King of Swing! This 1962 Reissued Gretsch Guitar has been a favorite of many famous musicians over the years since first being endorsed by the great Chet Atkins in 1962 under the name the Gretsch "Country Gentleman". George Harrison of the Beatles was also a proud owner of this Gretsch model, appearing with it on the Ed Sullivan show and using it during the Beatles first US tour. It has also been a favorite of Elvis Presley, who owned this same style model during it's manufacturing as the Gretsch "Country Classic". We are excited to offer this "used" guitar, which is in mint condition, still has the plastic truss rod cover, plastic pickguard cover, padding on the vibrato bar, and has nearly NEVER been played!!! With only one previous owner (purchased new in 2005) and all of the original Gretsch Certificates and Proofs of Purchase included, this is truly a rare find!! These beauties sell new for $2999.99, but we're offering you a deal at only $2450 for this beauty - that's nearly $550 below our big box store competitors! Don't miss out on this rare opportunity! The Mouth Bow is an instrument of African origin that has been found all over the world! Evidence of this instrument has been found as far back as 13.000 BC!! There's not many places you can find a mouth bow, but we've got 'em! This simple string instrument was built right here in Brown County, Indiana by one of our local luthiers! It consists of a flexible piece of Poplar, Cherry, or various other woods, and is strung with a standard guitar string of various gauges. Thought to be one of the oldest instruments in the world, and found in nearly every culture across the globe, the Mouth Bow is easy to learn and makes a great addition to your musical collection. Here you can check out the incredible Buffy Sainte-Marie playing a version of the Mouth Bow during her appearance on Sesame Street! Pick up your own Brown County Mouth Bow this weekend for 10% off! 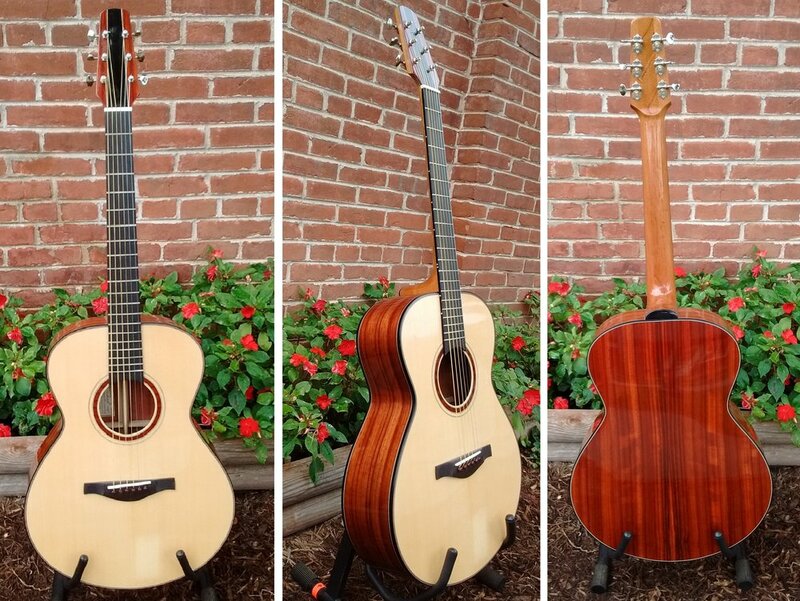 Check out these beautiful handcrafted guitars by local Bloomington, Indiana luthier Thomas Roeger! We are very proud to have Tom as the builder of the winning guitar for the Indiana State Fingerstyle Guitar Festival (this weekend in Brown County) and to stock a variety of his beautiful guitars here at our shop! Don't miss out on our special offer of 10% off any of Tom's guitars this weekend only!! REGULAR PRICE = $1999 , 10% OFF THIS WEEKEND ONLY! REGULAR PRICE = $2100 , 10% OFF THIS WEEKEND ONLY! White River Dulcimer Company was the former home of the Meadowlark, Traveler, and Navigator hammered dulcimers. From 2016 to 2018, these quality instruments were built by Michael Opp and Brent Schindler in Indianapolis, IN. In May of 2018, White River Dulcimer company was sold back to Rick Thum in Missouri, the originator of these finely crafted instruments. Rick Thum is widely known as one of the most influential dulcimer players of the last decade and an incredible luthier with many years of experience. We look forward to working with Rick in the future! While we are sad to announce this closing of White River Dulcimer Company as we know it, we are very lucky to have the final batch of these great instruments in stock in our store! These quality, affordable hammered dulcimers were made with an incredible dedication to quality , a great attention to detail, and a price that can't be beat! If you have ever considered purchasing a Hammered Dulcimer, you surely don't want to miss out on this offer! Meadowlark 13/12 Hammered Dulcimer - Only 3 Remaining!!! The Meadowlark 13/12 hammered dulcimer (shown above), was built with the student in mind and has been in production for over twenty years. Fun and intuitive to play, the Meadowlark is the perfect instrument to build your foundation. Constructed from quality materials, the Meadowlark boasts hard maple pin blocks, a walnut frame and comes standard with a Baltic birch-ply top. We only have 3 remaining Meadowlark Dulcimers in stock!!! Don't miss out!!! The final batch of these hammered dulcimers is here and there are only a few remaining! Take advantage of this Special Offer and take home a part of White River Dulcimer Company history!!! Package includes: Hammered Dulcimer, Padded Carrying Case, Set of Hammers, Tuning Hammer, Dowel Stand for Tabletop Use. Check out the new Music Row Collection by Morgan Monroe Instruments!!! They say a little bit of Nashville, a touch of Austin Texas and even a dash of the west coast surfer vibe can be had with the new Music Row Collection. Morgan Monroe has been making guitars now for around 20 years...But, these guitars are some of their best playing and best sounding yet! Morgan Monroe guitars are designed by musician’s who care about craftsmanship & playability, and want that traditional “Golden Era” sound at a price most musician’s can afford. 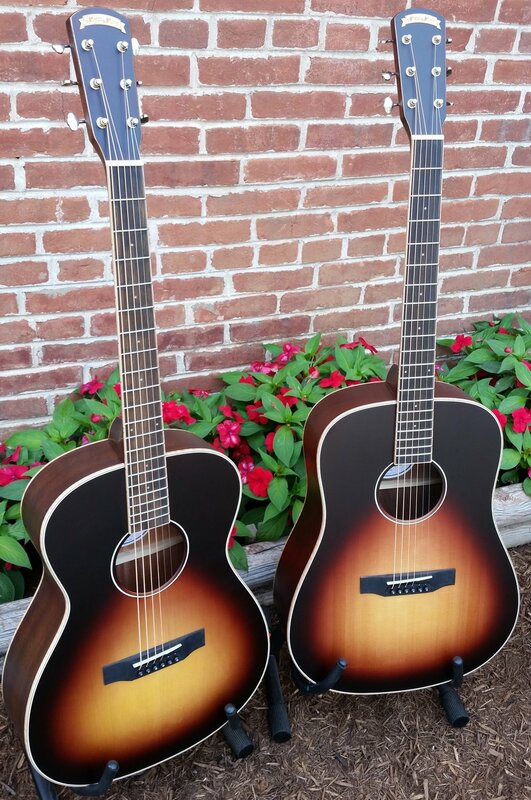 The woods and tones in these guitars are sure to be a classic in anyone’s collection. Check out this fun variation on a traditional African instrument - the Cigar Box Kalimba! The Kalimba (also known as mbira, marimbula, or thumb piano) is an instrument of African origin that is thought to be thousands of years old! In all of that time the instrument has gone through many variations in style and tuning. Once the closely kept secrets of medicine me and elders, this fun instrument can now be found in a variety of forms around the world! We think you're going to love this variation on the Kalimba made out of a cigar box! These instruments sound great, are fun and unique, and are really easy to play! Available as part of our Friday Feature Special for 10% off our regular Kalimba pricing of $49!! Build Your Own Banjo Kits! The Mountain Man Banjo Kit (created by Brian Carver of Lafayette, IN) is here!! Make some mountain music with this Appalachian inspired Mountain Banjo that you can build yourself! This kit includes everything you need to make your own mountain banjo! You need no woodworking experience or specialized tools. You’ll be free to enjoy the unique experience of building your own instrument without the worry of costly mistakes. Each kit includes easy-to-follow directions with illustrations. The end result is a fully-playable banjo with a personal connection to you that you can enjoy for years to come! Stain or paint it and make it your own, or just put it together and play it plain! The possibilities are endless with this fun instrument! Now you can save on shipping by ordering a Carver Banjos Mountain Man Banjo Kit direct from our store! Regularly priced at $115 from our shop, we are now offering an introductory special on these great kits for 10% off our regular prices! Ortega Guitars has been well known for years for their incredible Classical Style Guitars, so it only seemed fitting that they venture into the world of ukuleles...And we're glad they did! Check out these new, beautiful Earth Series Ukuleles by the Ortega Guitar Company! Earth Series Ukuleles - Only $99.99 each (or get an Acoustic-Electric for only $149.99)! Whether you are playing for fun or performing professionally, the Ortega Earth Series Ukulele will make a great addition to your ukulele family! With outstanding quality, these ukuleles are entry-level only in their price point! Each Ortega Earth Series Ukulele features an Okoume Top, Back, & Sides with Satin color finish, Mahogany Neck, and Sonokelin Fretboard & Bridge. FRIDAY FEATURE SPECIAL = $99.99 each! Take advantage of this special offer on Deering's 5-String Goodtime Banjos - 10% off all Memorial Day Weekend!!! It's very rare that you find one of these great banjos at such an affordable price, so don't delay! Only $440 - now through Monday!!! The Goodtime Banjos by Deering are the absolute lowest priced American-made banjos available! These banjos are heralded by teachers and artists alike and are, by far, the best banjo to get started on! Easy to play! Durable and easy to maintain! The Goodtime banjo produces a vibrant ringing tone from its natural finished violin grade maple rim. At only 4 pounds, the weight makes it ideal for both children and adults to play and to travel with conveniently. With a clear and resonant responsiveness, this banjo is perfect for either Old Time or Bluegrass playing! MEMORIAL DAY WEEKEND SPECIAL = $440 GOODTIME BANJO DEAL!! These traditional wooden toys are fun for all ages, and now you can build your own with our Limberjack and Acrobat Toy Kits (made by Bill Arnold of Greencastle, IN)! Kits regularly priced at $25 each - THIS WEEKEND ONLY $20 PER KIT OR PURCHASE A COMPLETED VERSION FOR ONLY $25!!!! These fun dancing dolls have been popular street entertainment for hundreds of years. Whether you call it a Limberjack, Limberjill, Jig Doll, Busker's Puppet, or any other name, it's sure to bring hours of entertainment! Just listen to that fiddle and banjo play while your Limberjack dances along creating various rhythms in time with the music! A great addition for any busker! If the Limberjack is not for you, how about an Acrobat Toy? These adorable bears flip and turn all with the squeeze of your hand! Such fun! Combine the graceful curves of an authentic F-style body with a hand-carved solid spruce top and you've got an instrument with that real 1920s sound -- but enough power to cut through today's ensemble playing. The thin "V" profile maple neck fits comfortably in your hands, and with no fretboard extension, strumming is easy. 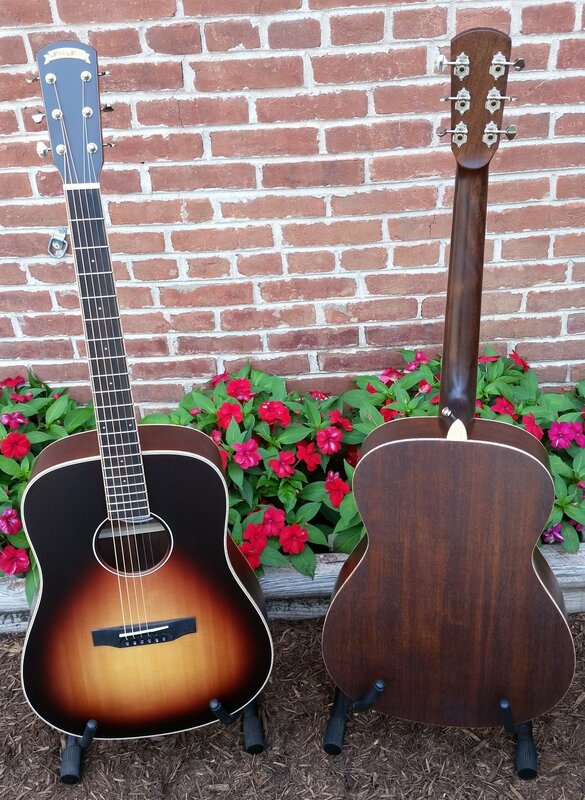 Check out these great features: Solid Hand-Carved Spruce Top, Maple Back and Sides, Maple Neck with thin "V" Profile, Rosewood Fretboard, Ebony Adjustable Bridge, Bone Nut, Grover Tuners, Adjustable Truss Rod, and Satin Brownburst Finish!!! FRIDAY FEATURE SPECIAL = ONLY $325 WITH HARDCASE INCLUDED!!!!! The Special 5 Cigar Box Guitar is a 23 3/4" scale instrument that's great in either open or standard tuning! There are no rules for a Cigar Box Guitar - Play it with a slide, tune it like a ukulele, open tuning or standard tuning - Anything goes! Designed with the classic vintage style of a true cigar box guitar but built with mahogany for a unique folky tone that's unlike anything else. For even greater versatility, the Special 5 comes in a cool electric version that features a lipstick pickup and single volume control so you can plug into your favorite amp or recording setup. With a slide and some effects pedals you can explore a whole new world of sonic fun! Get started off right with our Friday Feature Special Package Deal! This deal includes the Special 5 Cigar Box Guitar, A Danelectro Mini-Amplifier, and 15 foot SignalFlex Cable. This total packages is valued at over $300, but you can get it all this weekend for only $218!!! It's finally Spring! It's time to put away your hats, coats, and sweatshirts, and get ready for some warmer temperatures! We can help you get the season started off right with a new t-shirt from Weed Patch Music Company! Now offering a discounted price of only $12 for all of our remaining sizes of the black and grey Weed Patch Logo T-shirts! And, Just In - The original Weed Patch Music Company T-Shirt design (featuring Lucy the Bluegrass Beagle) is back due to popular request! Offering a special price this weekend on our Original Lucy Logo T-Shirts - only $15 this weekend only!!! We are very excited to announce today's Friday Feature Product - "The Brown County Backpacker Flute". The Brown County Backpacker was created exclusively for Weed Patch Music Company by Douglas "Thunder Horse" Goldsmith of Thunder Horse Flutes (Greensburg, IN). These incredible flutes are made of Western Cedar with an Eastern Cedar Block, decorated with a golden maple leaf and are available in the Key of "A". The ease in which each of these Thunder Horse Flutes plays makes them perfect for the beginner! With just a gentle breath, these flutes come to life in song. Today we are offering these exclusive flutes for only $85 each with a carrying case included!! Don't miss out - They won't last long!! 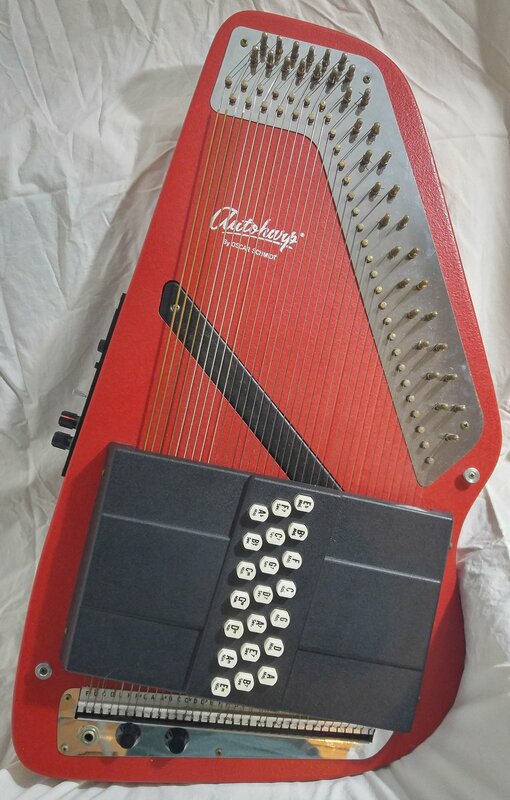 This Vintage Solid Body Electric Autoharp in Candy Apple Red is an incredibly unique find! We have searched far and wide and have not been able to find a single other Autoharp like this rare Vintage model that we have available! This Autoharp, made by Oscar Schmidt, features 36 strings, 21 chords, and is a Solid Body Electric Model, featuring Volume and Tone Knobs, Speed and Depth Control Switches, and Built-In Chorus Effects. This fully functioning Autoharp has all of it's strings and electronics in working order and is in near-new condition! This is truly quite the collector's instrument! As part of our Friday Feature Special, you can take home this Vintage Autoharp this weekend for 10% off! Now only $382.50 (original heavy-duty hardcase included)!!!! !